But this unit is not backward compatible and does not convert HDMI to RCA composite. This converter simply cleans and up-scales the image and displays it in these resolutions (720p & 1080p). Convert AV (CVBS) composite video and FL/FR stereo audio signal to HDMI signal. Wipe away the fog of war with the Armor3 AV to HD Converter Box, the most battle-ready piece of tech that turns your AV signal to HD signal. Converts your AV signal to HD signal up to 1080p. Compatible with most HDTVs and HD monitors. 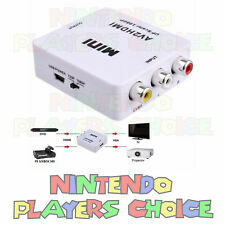 Mini Composite AV CVBS 3RCA to HDMI Video Converter Adapter 720p 1080p UP scaler. Support HDMI 1080p or 720p output. Converts analog composite input to HDMI 1080p (60HZ) output,displayed on 1080p (60HZ) HDTV/Monite. ---This item provides RCA Inputs to HDMI Outputs, great for your old gaming consoles or other older media consoles to connect to modern HDMI Screens and Monitors. ---Please note, this is RCA Input to HDMI Output, not the other way around. ---Features ---Converts analog composite input to HDMI 1080p (60HZ) output,displayed on 1080p (60HZ) HDTV/Moniters ---Supports both HDMI 1080p or 720p output. ---Provides advanced signal processing with great precision,colors, resolutions, and details. ---Plug and play. ---Support PAL, NTSC3.58, NTSC4.43, SECAM, PAL/M, PAL/N standard TV formats input. Package comes with Instruction Manual, Adapter itself, and a power cable. Be sure to plug adapter in to the wall in order for it to work. Adapter Cable for both NES/SNES to NES Classic Mini. 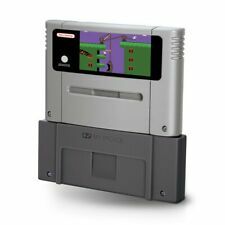 Compatible Platform: NES Classic, NES, SNES. Just plug and play, needs no driver. Adapter Cable for both NES/SNES to NES Classic Mini. Compatible Platform: NES Classic, NES, SNES. Current Generation. Mouse, Keyboards & Keypads. We will do our best to resolve any issues that may arise. Wipe away the fog of war with the Armor3 AV to HD Converter Box, the most battle-ready piece of tech that turns your AV signal to HD signal. • Armor3 Converter Box for AV to HD. 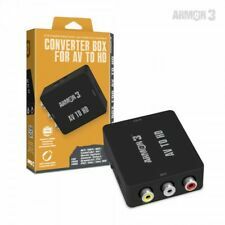 Armor 3 AV to HD Converter! Nintendo Wii. Nintendo Wii U. Nintendo DS. Nintendo DS Lite. Nintendo DSi XL. Nintendo 3DS. Nintendo 3DS XL LL. USB 1.1 and USB 2.0 compliant. Convert AV (CVBS) composite video and FL/FR stereo audio signal to HDMI signal. AV/CVBS Composite RCA to HDMI Converter Adapter. 1x Mini CVBS to HDMI converter. CANNOT be used as HDMI to RCA. 1 x Composite AV to HDMI converter. You are looking at a Nintendo 64 SNES AV & RF Converter Box Adapter. The item pictured is the item you will receive. Compatible with Mac OS X or above, Windows XP, Vista and Windows 7, Windows 8, 32 bit and 64 bit. No driver needed, suitable for both, Desktop and Notebook PCs.